One day, Mike received an unexpected telephone call from the local SPCA which is only about 1/2 hour away. They said they needed help with a pig rescue. When he arrived at the location they gave him, Mike could see that this was a horrible neglect case. Mike took the nine and dropped the bull at his new home. 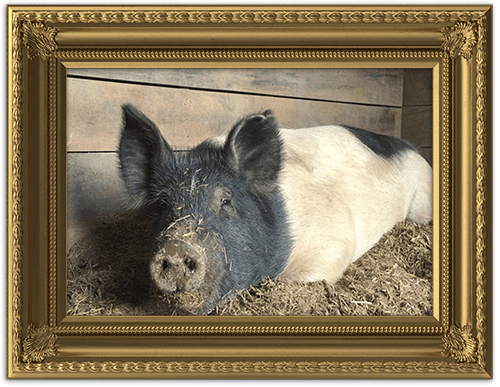 All of the animals were emaciated and starving, including Wilson. The people involved with the neglect were prosecuted and were found guilty of animal neglect with fines, probation, and a lifetime ban from owning animals.